2017 marks Shri Surya Narayan Mandir’s 24th year since its establishment in 1993. 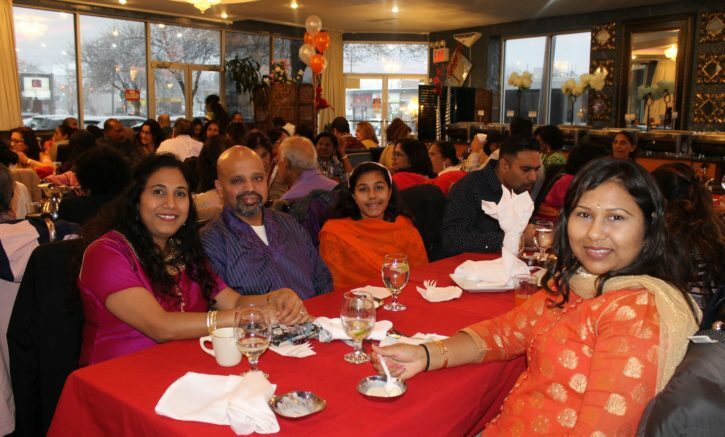 The Surya Mandir family gathered together on December 9th at Jassie’s Fine Indian Cuisine Restaurant to enjoy an afternoon of fine dining and mellow entertainment provided by some of the very talented youths of Surya Narayan Mandir. Anniversaries are a time of reflection – a time to look back and ask ourselves what we set out to do 24 years ago, and how much have we accomplished so far. As mentioned by our beloved President, Pandit Manuj Prasad during his opening remarks, the following are elaborations. SSNM’s motto is “Keep your dharma alive.” Each undertaking is built on this foundation. What can be done to preserve and promote dharma and our Sanskriti? SSNM takes pride in educating and empowering its youths through Annual Spiritual Retreats, weekly Surya Veer Sang, dance, kirtan, and tabla classes to name a few. Young adults and adults have the opportunity to attend Vedanta and Bhagavad Gita classes. Earlier this year, the Surya Senior Sang was started so as to give elders in our community the opportunity to come out and meet with other seniors and socialize and worship together. The group meets every Wednesday and is managed by our beloved Mata Ji. And perhaps, most exciting of all this year is the return of Yoga classes! After heeding the requests of many devotees who are fascinated about learning and practicing Yoga, Guru Ma resumed classes in November. The class meets every Wednesday evenings and already has over 20 students! Many thanks to Guruma Radha Hardowar for inspiring the students with her enthusiasm. This commitment to teaching about dharma shows that SSNM is truly keeping up its mission to keep dharma alive. Surya Narayan Mandir coordinates with other temples and leaders in the community and hosts and participates in events that all share its mission of preserving dharma. For the past few years, SSNM has been the proud host of the grand Ramayan in the Park. Each year for one week, our courtyard is transformed into Ayodhya and a different Vyas presides each night and eloquently reads a kanda from the Ramayan. SSNM also participates in the Holi Parade, an event that draws large crowds, local politicians, and even a few stars to come out and celebrate Holi. Over the years, SSNM has accommodated large conferences such as the Hindu Caribbean Conference and the Women’s Conference, and was privileged to host brilliant speakers such as Rajiv Malhotra and Swami Aksharananda. Most recently, SNSOS – Surya Narayan Seva Outreach Sang raised funds to assist in the relief efforts of those who were affected by Hurricanes Harvey and Irma. Funds were donated to the Lion’s Club, a trusted organization that utilizes 100% of the money it receives for relief efforts, and takes no deductions for its overhead expenses. Monies were also donated to the 103rd Precinct Police Explorer Program, to help youths who would like to become cadets in the police force, and assist in protecting our community. For Diwali 2017, SSNM devotees of all ages reached into their pockets and piggy banks and donated toys and gifts which were distributed to Jamaica Hospital’s pediatric patients and to the moms of newborns. Finally, SNSOS continue with its selfless efforts in Guyana to help fellow Guyanese who are experiencing hardship in maintaining their health and meeting basic needs. Trips are made to some of the impoverished neighborhoods in Guyana so that members of the group can provide basic medical attention to people. 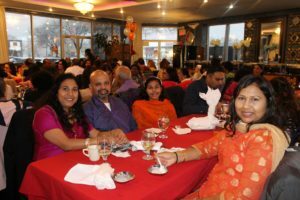 The seva overseas continues with donations to orphanages in Guyana, and scholarship awards to top students, allowing them the opportunity to further their studies in the United States. These are a few examples of SSNM’s selfless service or Seva activity which demonstrates the upholding of its motto. Anniversaries are not only a time to reflect on the past, but also a time to look towards the future. We celebrate all that was accomplished and look for ways in which we can meet and exceed those accomplishments in the years to come. SSNM’s next mission is to build the first Hindu school in the United States. This school will serve as the focal point in carrying out its mission by continuing to teach all ages, serving the community, and keeping our dharma and culture alive. With the support of Guruji Pt. Ram Hardowar and Guruma Radha Hardowar, the continued love and dedication of the devotees, and most importantly the blessings of Surya Bhagwan, future anniversaries of Shri Surya Narayan Mandir will ALWAYS be grand celebrations! Click here for additional pics from the occasion.